). Thanks for the inspiration, lady! 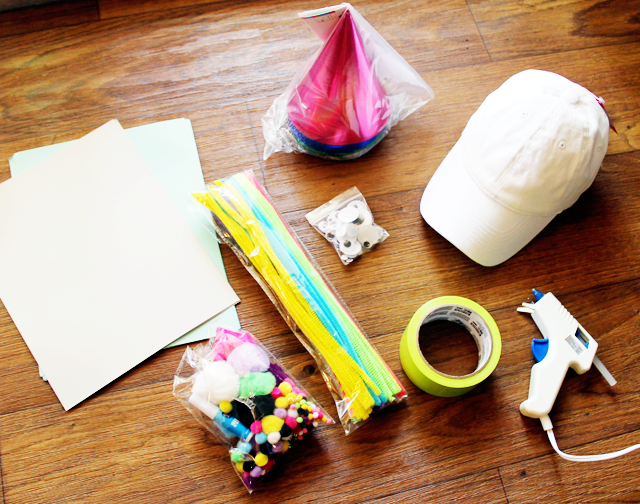 I used a baseball cap, two big googly eyes, green Duct tape, party hats, a hot glue gun and construction paper (I ended up not using the colorful cotton balls, but they could be fun to decorate with as well) and not pictured are rhinestones because I like my dinos to be fancy. 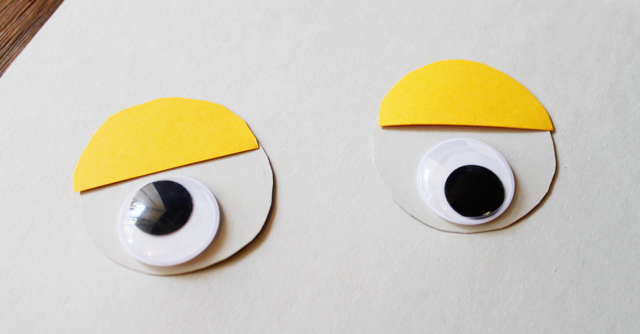 First I cut out two circles of white construction paper for the eyes and a yellow circle cut in half for eyelids. Next I cut a black pipe cleaner into six equal pieces and glued three to the back of each eyelid with the hot glue gun and rolled them up into cute curlicues. 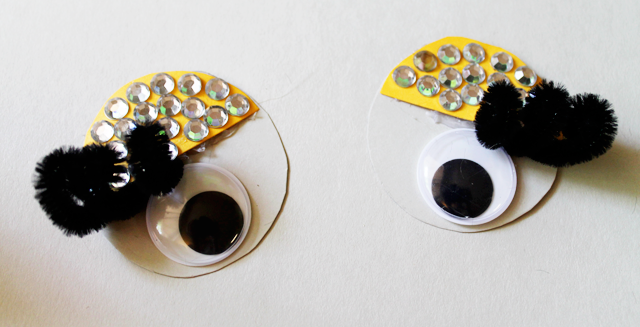 Then I glued the googly eyes to the white circles, glued down the eyelids and glitzed 'em up with some rhinestones. Next I covered the whole hat in green Duct tape, which was time consuming and made the scissors kind of gooey, so be warned. I suppose if you find a green hat, you could skip this step. 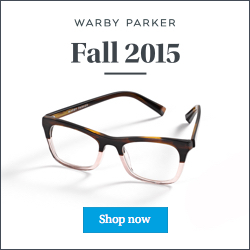 I could not. 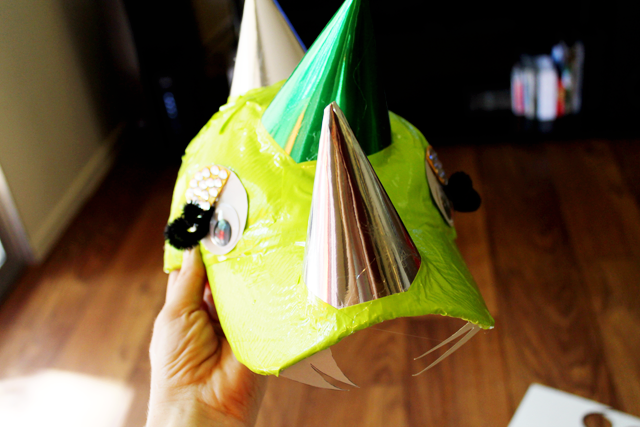 Then I took four party hats (two green, two silver) and cut them down so they could fit in a row from the bill to the back of the hat and glued them with the hot glue gun (they were a little crooked, but I just went with it). 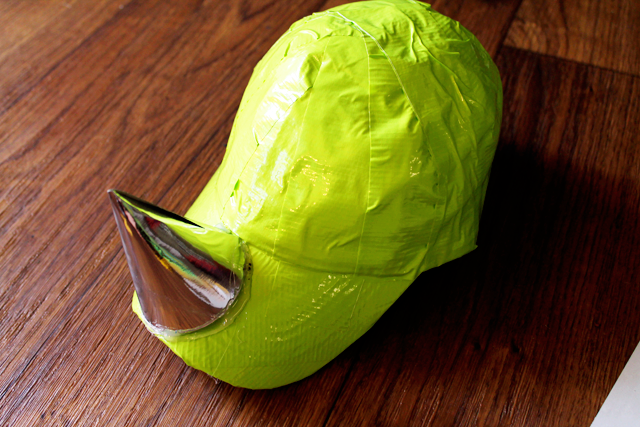 To cover up the glue and reinforce the horns, I continued wrapping tape around each horn. Then to finish this quirky little dude up, I cut teeth out of the white construction paper, folded the flap down and glued them to the underside of the bill. Ta-dah! 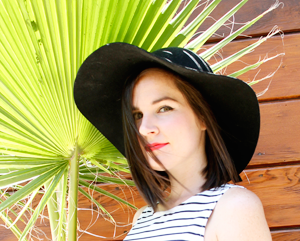 The goofiest, glam dino hat the world ever did see. YOU ARE SO CRAFTY I CAN'T EVEN STAND IT.